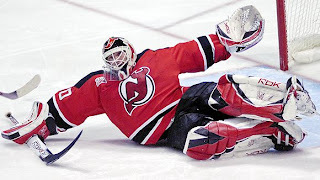 The Sin Bin Sports Blog: Was Last Season The Beginning Of The End For Martin Brodeur? Was Last Season The Beginning Of The End For Martin Brodeur? Since coming into the league in the 1990 draft, future hall-of-famer, Martin Brodeur, has posted 30+ win seasons 13 times, eight of those seasons breaking the 40 win mark. He is the all time leader in wins and shutouts, has won three Stanley Cup Championships, and has made the playoffs in 15 of his 17 seasons played. However, last season was a season that Brodeur would like to forget. He produced his first losing season of his career, going 23-26 with a save percentage of .903, and a goals against average of 2.45. Along with some of the worst numbers of his career, he missed significant time once again due to a hip injury. Looking forward, one can only think that last season may have been the first domino to fall that could send Brodeur into retirement. If Brodeur does prove he can play at the beginning of the season he may have to battle fellow goalie, Johan Hedberg, for the number one spot. Hedberg went 15-12 with .912 save percentage, and 2.38 goals against average last season proving he could be a formidable replacement for Brodeur. Hedberg could get the nod if Brodeur looks to be off his game early next season. Brodeur will be entering the last season of his contract with the New Jersey Devils next season, and will become an unrestricted free agent at season's end. If Brodeur does not have a bounce back season his $5.2 million salary could prove to be quite valuable in trying to lock up Zach Parise.